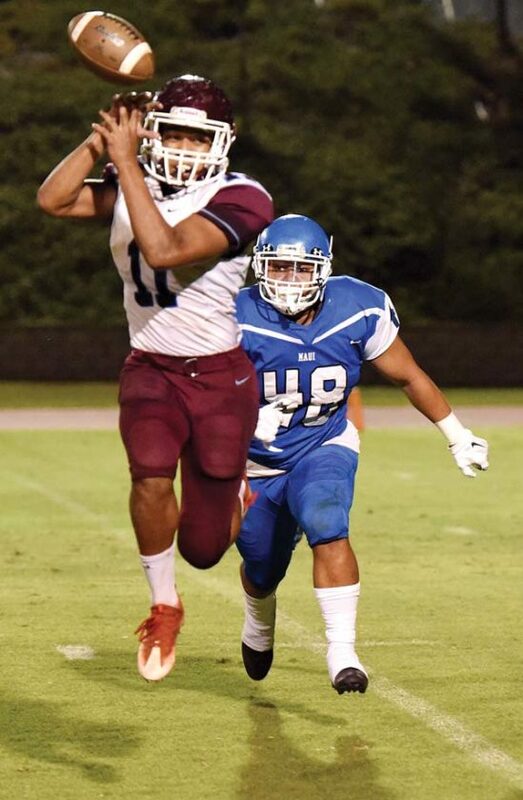 When Baldwin High School’s Chayce Akaka and Maui High’s Atu Falekaono played together for the Kihei Dolphins in their Pop Warner football days, they both knew their paths might cross on the gridiron again. They did, a few times this season, as they battled for the Maui Interscholastic League Division I title. 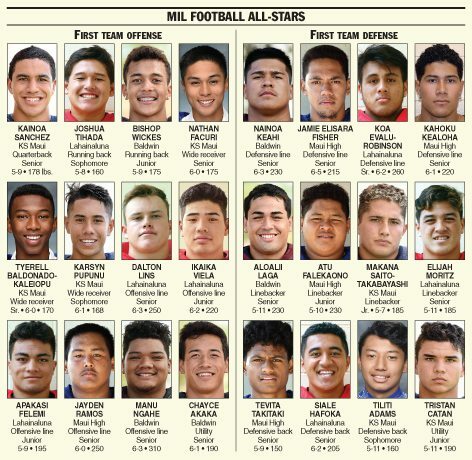 The childhood teammates lead The Maui News 2017 MIL Football All-Star teams. 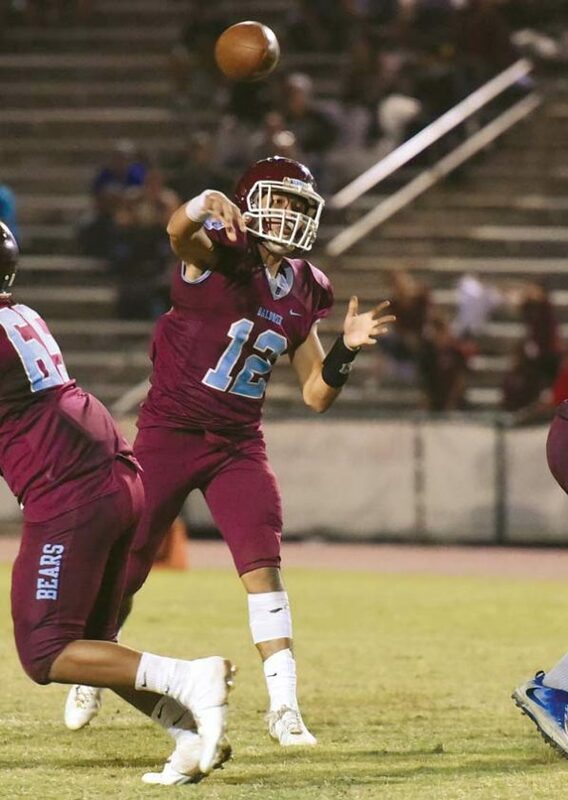 Akaka, Baldwin’s senior quarterback, wins the Offensive Player of the Year honor for the third straight season, joining former Bears QB Keelan Ewaliko as the only player ever to claim three straight MIL POY nods. Ewaliko recently finish his career at the University of Hawaii. “I mean, very cool for me to be next to another great football player like Keelan Ewaliko,” Akaka said. Maui High’s Atu Falekaono helped the Sabers win the MIL Division I crown and earn their third-ever state tournament berth. Akaka finished his MIL career with 50 touchdown passes, a league record, against 14 career interceptions. In three seasons, he was responsible for 73 touchdowns total, also an MIL record. He passed for 3,552 yards and ran for 1,799 in his career. He had 19 touchdown passes and eight interceptions this season, but he led the league in scoring with 65 points — on 10 touchdowns, a field goal and three extra points. Akaka ran for a league-best 804 yards and eight touchdowns, caught six passes for 104 yards and a touchdown, and returned a kick for a touchdown. “I feel like I came pretty far, playing with different people, having different linemen, different receivers. The run game had to come this year because the new linemen had that big stack, like over 1,000 pounds in front of me,” said Akaka, who made the MIL first team at the offensive utility spot. He is joined on the first-team offense by teammates Bishop Wickes (running back) and Manu Ngahe (offensive line); Kamehameha Maui quarterback Kainoa Sanchez and wide receivers Nathan Facuri, Tyerell Baldonado-Kaleiopu and Karsyn Pupunu; Maui High offensive lineman Jayden Ramos; and offensive linemen Dalton Lins, Ikaika Viela and Apakasi Felemi, and running back Joshua Tihada of two-time Division II state champion Lahainaluna. Akaka, who just turned 17 years old this month, is currently out for basketball after skipping the sport for the first time in high school last year. Also a standout baseball player, Akaka said he is leaning toward football for college. Falekaono, a junior linebacker, was the choice of the league’s coaches as Defensive Player of the Year. Falekaono is joined on the defensive first team by teammates Jamie Elisara Fisher (defensive line), Kahoku Kealoha (defensive line) and Tevita Takitaki (defensive back); Baldwin’s Nainoa Keahi (defensive line) and Aloalii Laga (linebacker); Lahainaluna’s Koa Evalu-Robinson (defensive line), Elijah Moritz (linebacker) and Siale Hafoka (defensive back); and Kamehameha Maui’s Makana Saito-Takabayashi (linebacker), Tiliti Adams (defensive back) and Tristan Catan (utility). Maui High’s Rodney Figueroa is the choice of his peers as MIL Coach of the Year after leading the Sabers to a 5-3 league record and the Division I crown. The first significant moment this year between Akaka and Falekaono came during their teams’ first meeting on Sept. 16. Akaka dropped back for a pass with Falekaono looming in the flat about halfway between the quarterback and his intended receiver. Falekaono’s interception — “He got me on that one,” Akaka said — led to a touchdown that put the Sabers ahead by 12 in an eventual 32-21 win over the Bears that clinched the MIL Division I first-round crown. Falekaono had three sacks, forced a fumble and recovered a fumble in the game, which catapulted the Sabers to their third state tournament berth ever. “I’ll tell you this: Me and him, we played with each other since we were little kids,” Falekaono said. “We started off when we were playing tiny mites together. Me and him played in Pop Warner since our intermediate year and by the time he was 8th grade and I was 7th grade, he went to Baldwin and I had one more year at Lokelani (Intermediate School). Baldwin–Ian Collier, Mahi DeFrancia, Kainoa Kaina, Jason Kaya, Christian Reinhardt, Brayden Reys-Sojot, Sione Tulahe. Kamehameha Maui–Rhys Buen, Daniel Kapua, Damon Martin, Kiha Mossman, Darius Mynar. King Kekaulike–Isaac Akinaka, Mark Amaral, Kele Pacheco, Rilee Peters, Titus Rodrigues, Lucas Tamayose. Nichlous Wenger. Lahainaluna–Isaiah Ah Wah, William Kai Bookland, Kaihulali Casco, Braeden Estores-Castillo, Taai Galoia, Kawehi Gillcoat, Bailey Honda, Joshua McCoy, Derek Perez, Brysen Rickard, Pablo Rico, Christopher Wintermeyer. Maui High–Casey Barrett, Honu Feldt-Antonio, Storm Crozier, Kimo Honokaupu, Kalia Kapisi, Justin Pagaduan, Justin Pulido, Chance Rodrigues, Antonio Savou, Kainalu Tancayo.